SMART Communications, Inc., the country's leading mobile phone operator, together with the world's largest online encyclopedia operator Wikimedia Foundation, offers FREE access to Wikipedia. Since we all know that learning is evolving and online research is more efficient nowadays. SMART and Wikimedia Foundation will give an easy and access FREE browsing through the Wikipedia. From history, science, biography name it Wikipedia got it all information for you. SMART, Talk 'N Text, and Sun Cellular subscribers are all have FREE and unlimited access on Wikipedia. 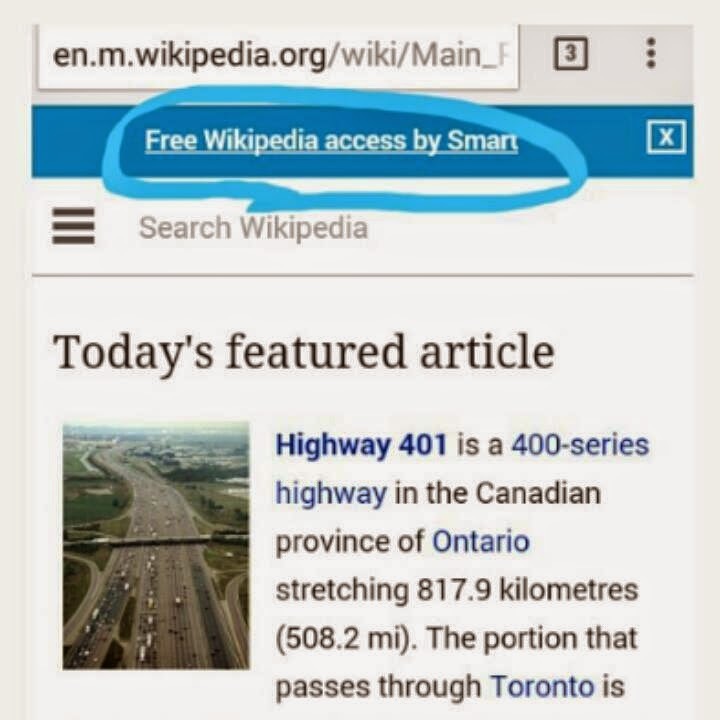 Not only that, SMART also offering Wikipedia access for FREE using its PowerApp mobile Internet platform. More so last September Smart and Wikipedia launched the Wikipedia Zero offer in the country to give subscribers unlimited access to m.wikipedia.org, zero.wikipedia.org, Wikipedia apps and other Wikimedia sites free mobile access that will run until February 3, 2015. That's it, SMART really concern about Filipinos learning, for them to partner with various organization and give free unlimited access about everything even mobile surfing right just register everyday texting FREE to 9999.